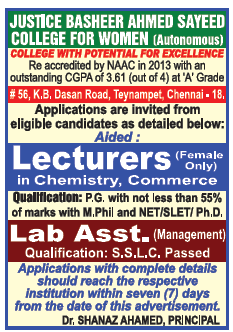 Justice Basheer Ahmed Sayeed College for Women, Chennai has advertised in THE HINDU newspaper for recruitment of Lecturers / Lab Assistant jobs vacancies. Interested and eligible job aspirants are requested to apply within 07 days from 17th June 2018. Check out further more details below. About College: The Justice Basheer Ahmed Sayeed College for women (formerly "S.I.E.T Women's College") maintained by the Southern India Education Trust, founded by Late Justice Mr.Basheer Ahmed Sayeed assisted by his wife Mrs. Fathima Akhtar and other colleagues, endeavours to maintain a programme that will develop women of great integrity, high character and culture who are fully capable of making enlightened choice and intelligent judgment in a social order which is dynamic and which requires the best contribution from every man and woman.